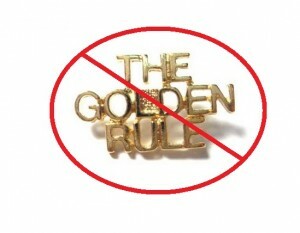 Down With The Golden Rule! The Golden Rule states: “Do unto others as you would have done to you.” Basically, treat everyone the way you want to be treated. Rubbish. This rule would be brilliant if we were all the same, and all wanted to be treated the same. But we aren’t. We are beautifully and gorgeously different. In subtle and obvious ways. We have different experiences in life, different beliefs, and different biological make-ups. While we all deserve the same love and respect, the ways we receive this love and respect can vary greatly. This is glaringly true when we look at the genders. Biologically, men and women have different wirings in their brains, different hormone levels, and different needs when under stress. For the most part (and on a continuum formed by our experiences and culture) when under stress, women need to talk, create community, and work in a team, while men need to zone-out, solve problems and work individually. So when a woman sees a stressed-out man and treats him how she’d like to be treated (let’s talk and do this together! ), it doesn’t help. And when a man sees a stressed-out woman and treats her how he’d like to be treated (solve the problem or dismiss it as unimportant), it doesn’t help. In fact, it can be infuriating. Gender is just one example, but this also varies individual to individual; we have different values, different sensitivities and different trigger points. Get Curious: Find out what someone really cares about. You may interact differently with someone who values justice, fairness and respect than with someone who values humor, lightheartedness, and silliness. Get curious about who they are, what matters to them, and ask them how they would like to be treated. You don’t need to invent the wheel with every relationship– chances are good they know what works for them and what doesn’t. Avoid assumptions. Trust Others To Know What They Need: When it’s clear you trust someone, they can ask for what they need. Otherwise, they can feel it’s pointless to ask. If someone needs space or to be left alone, but you refuse to hear it, they may try to trick you or weasel a little time to themselves in a way that’s hurtful to you. When you can trust them to know what they need, you open communication, keep intentions and actions direct and clear, and take a load off your own shoulders. You aren’t here to fix anyone. Ask For What You Need: This is a two-way street. We all have responsibility for ourselves and our actions. But throw people around you a rope. If someone is treating you in a way that doesn’t work for you, be clear and request what would work. If someone is wanting to help and isn’t sure how, share what would be helpful. Empower those around you to treat YOU the way YOU want to be treated. So here’s the new rule: Treat others they way they want to be treated! Okay, okay, there may still be room for the Golden Rule and the belief that we are all One… but functionally speaking, what’s possible for you in this? Give it a try and let us know how it goes!